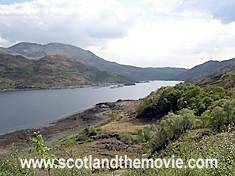 Why not include this film location on the itinerary of one of our self drive Scottish Movie Locations Tours. Cameron goes to stay with Andy (Paul Higgins) at his run down Scottish mansion. An establishing pan shot shows a loch with islands and a large loch side castle. 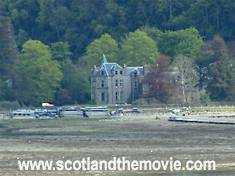 This was filmed at Polnish near Lochailort looking across Loch Ailort to Inverailort Castle. This may or may not have been the location used for Andy's house in Complicity. If anyone knows please let me know. 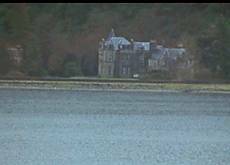 Incidentally Inverailort Castle was used during the second world war as the first base for the British Army Commandos. Subsequently Cameron has a conversation with Andy with the backdrop of a loch with islands in the background. Filmed near to the large car park on the A830 at Polnish near Lochailort. Low cloud in the movie hides the higher mountains and disguises the view.